Thankfully, I’ve never been in a real active shooter situation. 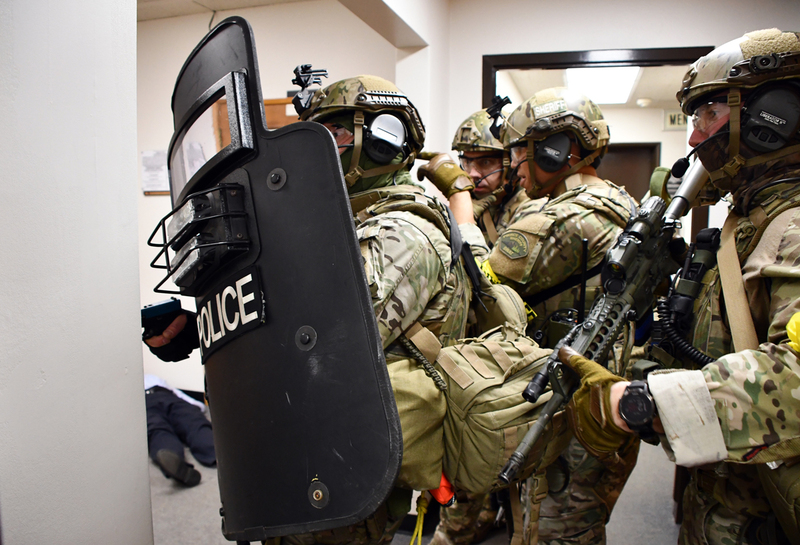 But yesterday, we had an intense training exercise in a courtroom on the 5th floor of the CCB to help prepare our court personnel, our Court Security Office, and our SWAT team if the unthinkable happens – and I got to participate. As a result, I know much better what to do and how to respond. First, in one scenario, there was a gunshot by the freight elevator. The sound from inside the courtroom was very muffled and therefore not very “alarming.” It reminded me we must be alert for sounds and actions that are out of the ordinary, even if they are not loud. We asked ourselves, “Is this really the police or a bad guy hoping to get us to open the door?” How do you authenticate that the good guys have arrived if they are behind a locked door? I recalled my military training, and asked a “challenge” question – one I thought only a real Pierce County deputy would know the answer to. The correct answer came forth, I opened the door and there was our SWAT team coming to help. Others stayed behind locked doors until the entire scenario was finished – which was also okay with SWAT. We learned we could call the Security Office at x8899 and, thanks to their cameras, they could confirm who was behind the door. Third, as we were being hustled down the hall to safety, I noted the SWAT deputy posted up at the main entrance of the courtroom. He was literally “standing in the gap” between the armed bad guys in the courtroom and us as we passed. No one was going to get to us without going through him. Finally, at the end, everyone gathered back in the courtroom for a debrief – to ask questions and learn what happened. It was then that I learned a very important truth – don’t mess with Sandi Rutten! In the scenario she was a “hostage” but ended up providing emergency first aid, negotiating with the bad guys, and was even in position to directly intervene. When I talked to Sandi, she said her service in the military helped prepare her for the challenge! 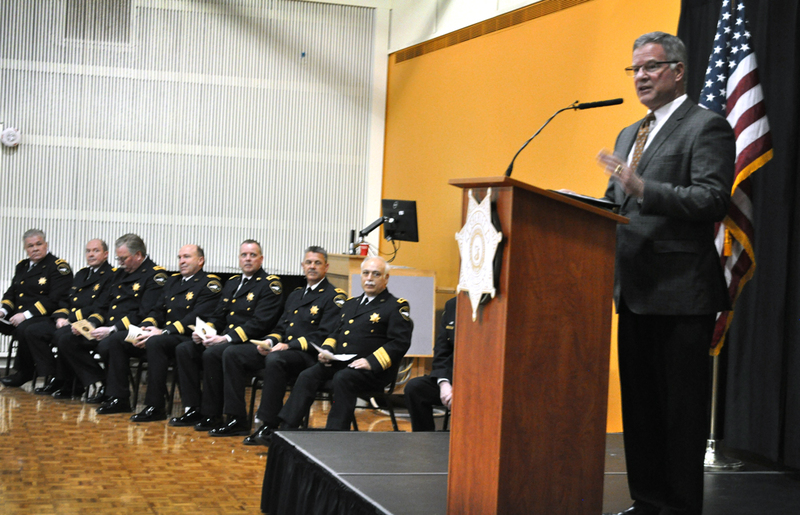 Other examples of “standing in the gap” were readily apparent at the Sheriff’s Annual Awards Ceremony this week. The Team Medal of Valor award went to Lieutenant Sean Kadow, Sergeant Patrick Davidson and nine other deputies who were first on-scene in support of Deputy Daniel McCartney. They were faced with a dark chaotic scene, and needed to locate Deputy McCartney, render aid, locate his murderer and protect citizens. Their valor and professionalism were amazing. One of the Medal of Merit awards went to Tacoma Police Department Chaplain Leslie Montgomery – who “stood in the gap” supporting Deputy McCartney’s family in the wake of their heartbreaking loss. Finally, when Tacoma Police was suffering from the loss of Officer Jake Gutierrez, our Sheriff’s Department Honor Guard, stepped in to make sure Jake was properly honored, and that his fellow Tacoma PD officers could grieve. Our Honor Guard was awarded the Team Medal of Merit. Congratulations and thank you to all those recognized for their remarkable work on our behalf. 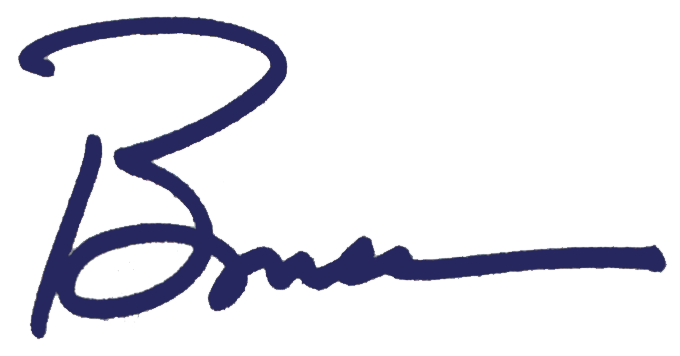 You may remember a few weeks ago I asked employees to fill out a short survey with your ideas and concerns about life and work in Pierce County. Thanks, again, to those of you who shared your thoughts with me. This Sunday my family will be gathering to celebrate Easter. We will be busy with an egg hunt with Blair, brunch, and worshipping at our church. If your family tradition is to celebrate Passover or Easter, I wish you a blessed day! And, for those of you taking some time off to enjoy Spring Break with your families, I wish you safe travels as you make memories!